prior to the WGC – HSBC Champtions at Sheshan International Golf Club on October 23, 2018 in Shanghai, China. 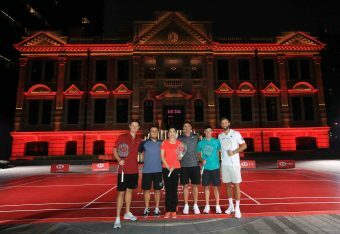 during a photocall prior to the WGC – HSBC Champtions at the Chamber of Commerce Shanghai on October 23, 2018 in Shanghai, China. Ahead of this week’s WGC-HSBC Champions at Sheshan International Golf Club in Shanghai, title partner HSBC today brought together five of the star-studded field for a unique Europe vs USA re-match aimed at helping grow the game in China. 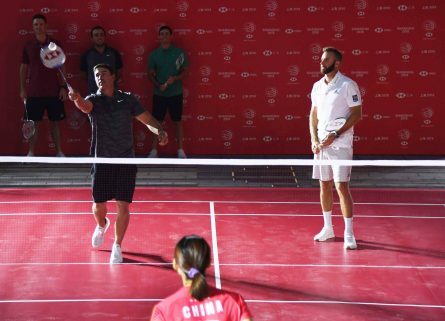 The event saw new World Number One Brooks Koepka, World Number Two Dustin Johnson, defending champion and World Number Three Justin Rose, World Number Five Rory McIlroy and World Number Six Francesco Molinari try their hand at one of China’s biggest sports. 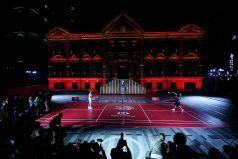 They swapped their drivers for badminton racquets on a specially constructed court outside the Chamber of Commerce Shanghai, in an event designed to appeal to Chinese fans and bring to life the ever-closer connection between Chinese culture and world-class golf. Just weeks after all six faced off at Le Golf National, it was also another chance to compete for bragging rights in the battle of Europe vs USA. 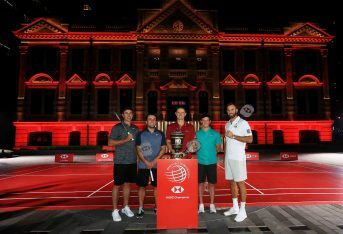 The event is part of title partner HSBC’s efforts to support the growth of golf in Asia through its flagship partnership with the World Golf Championships. When HSBC first brought HSBC Champions to Shanghai in 2005, golf in Asia was in its infancy, with a limited number of golf fans, no playing heritage and no significant event. Since then the partnership between HSBC and the WGC has allowed the sport to thrive in the region, with WGC-HSBC Champions earning the reputation of ‘Asia’s Major’ due to the high-quality golf on show and the impressive crowds of Chinese golf fans. Hosting the latest re-match between Europe and the USA on a badminton court is part of HSBC’s mission to grow the sport in the region. 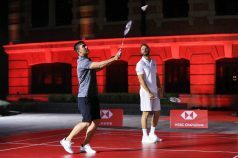 Badminton is one of the most popular sports in China and so giving these iconic golfers the chance to try the sport is designed to bring even more Chinese fans into contact with the game of golf. The event featured a coaching session given by former badminton World Champion Wang Lin, a star in China who was able to put the golf pro’s through their paces. HSBC is also partner of the Badminton World Federation. Competing for an increased prize fund of US $10 million at this year’s WGC-HSBC Champions, the star-studded field will be the strongest gathered in Asia this year. 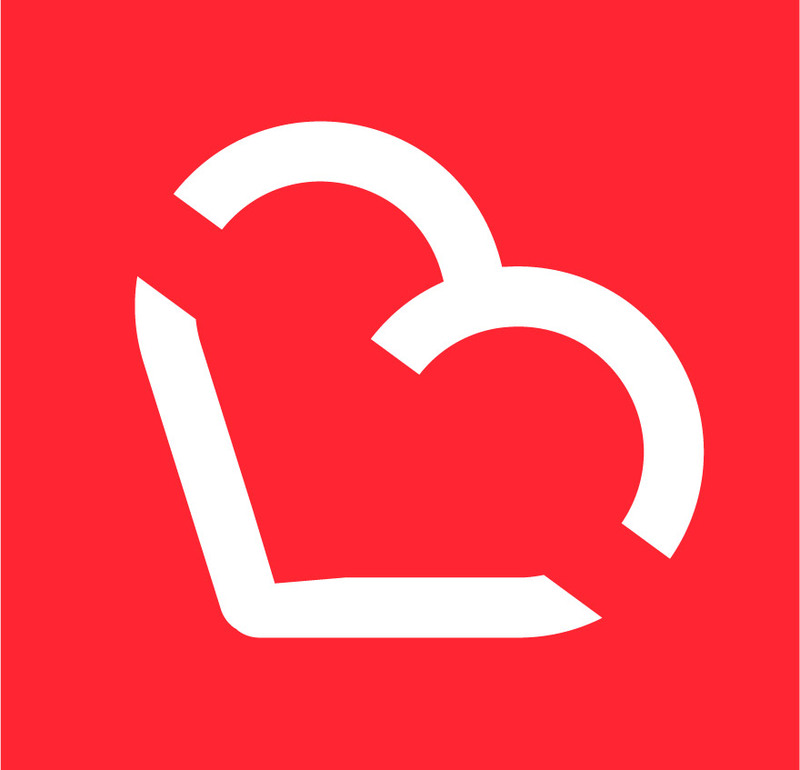 Organisers have also planned significant enhancements to every aspect of the spectator experience for this year’s event including adding virtual reality technology to the new Lakeside area boasting a spectator viewing platform with premium sightlines of the 2nd and 9th greens.